Comm Eye Health Vol. 29 No. 95 2016 pp 47 - 49. Published online 10 February 2017. Ocular allergy is a common inflammatory condition seen almost daily at the outpatient clinic. It occurs because the ocular surface is exposed to a variety of allergens, making it susceptible to allergic reactions. The hallmark of the disease is itching, and the clinical symptoms and signs are bilateral and vary according to individual cases. The common predisposing factors of ocular allergy include environmental allergens, genetic predisposition to atopic reactions and hot, dry environments. The patient may have associated systemic features like eczema, asthma and rhinitis. The first two forms of ocular allergies are sight-threatening. Both can lead to damage of the cornea by causing ulcers and scarring (secondary to inflammation of the ocular surface), ultimately leading to vision loss. Onset of vernal keratoconjunctivitis is usually in childhood (mean age 7 years) and it tends to become less severe by the late teens. It is more common in boys than in girls. 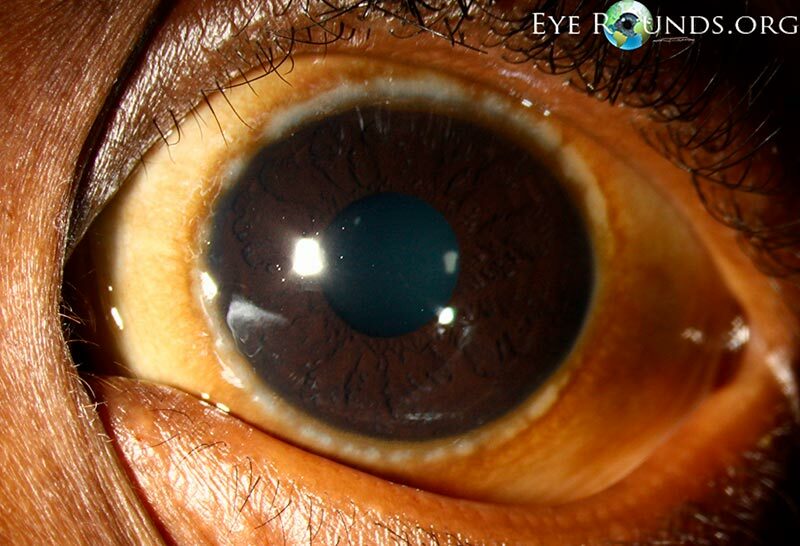 If left untreated, it can result in corneal conjunctivalisation and scarring (Figure 1). The symptoms are severe itching, watering, foreign body sensation and thick mucus discharge. 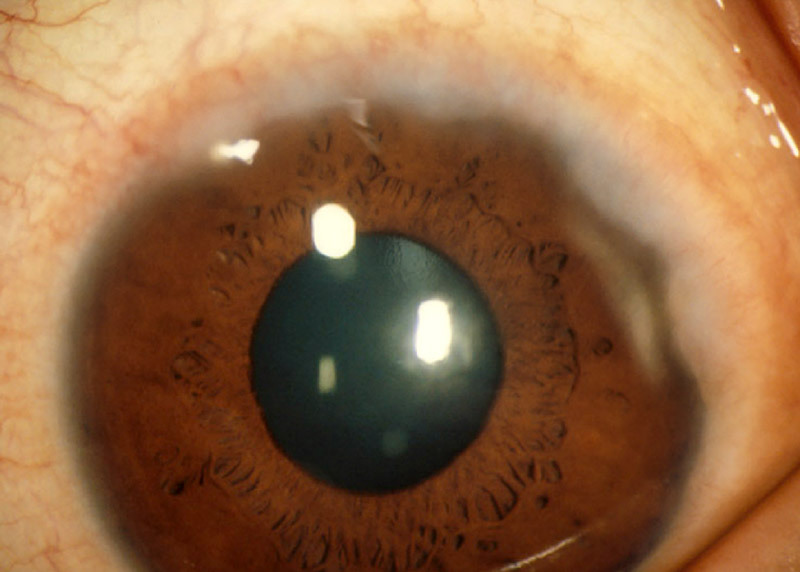 The hallmark sign of vernal keratoconjunctivitis is papillae formation in the tarsal conjunctiva; these can be large and irregular (known as cobblestone papillae) (Figure 2). There is conjunctival injection and/or hyperpigmentation and there may be peri-limbal small white dots (Horner-Trantas dots) (Figure 3). The limbus can become pigmented and the cornea can be affected with plaques and ulceration of the upper cornea. Atopic keratoconjunctivitis classically presents in adulthood and has a chronic and unremitting course. History: History of atopy (asthma, eczema). Severe itching, watering, foreign body sensation, mucus discharge. Symptoms occur year-round. Signs: Skin changes on the eyelids, e.g. erythema, dryness, scaliness and thickening. Papillae on the tarsal conjunctiva. In severe cases, conjunctival scarring and forniceal shortening may be present. These include acute allergic conjunctivitis (seasonal and perennial allergic conjunctivitis) and giant papillary conjunctivitis. Predisposing factors for giant papillary conjunctivitis include contact lens wear and irritation from exposed sutures or a prosthesis. 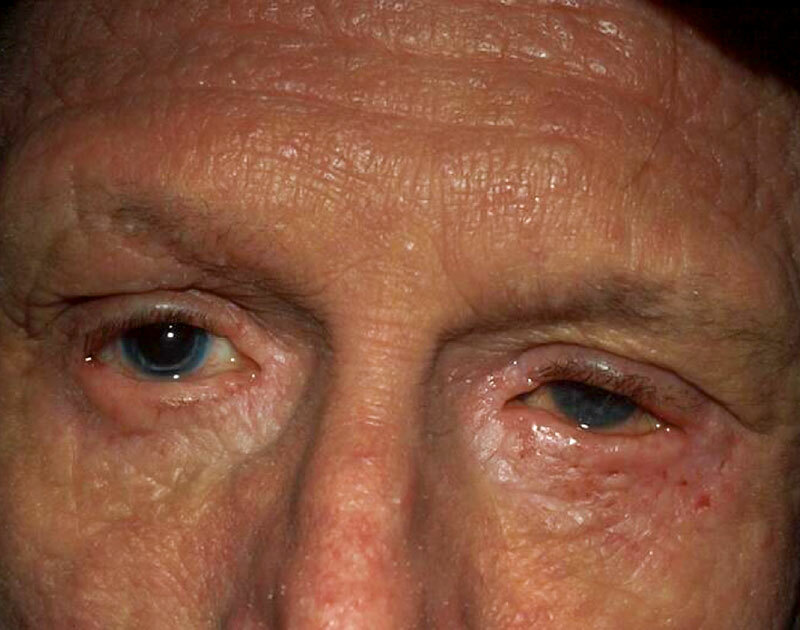 NOTE: All ocular allergies can have sight-threatening complications if not managed well, e.g. keratoconus (due to excessive rubbing) and glaucoma (due to the prolonged use or misuse of steroids). How do ocular allergies develop? The basic mechanism of these conditions is type-1 hypersensitivity. 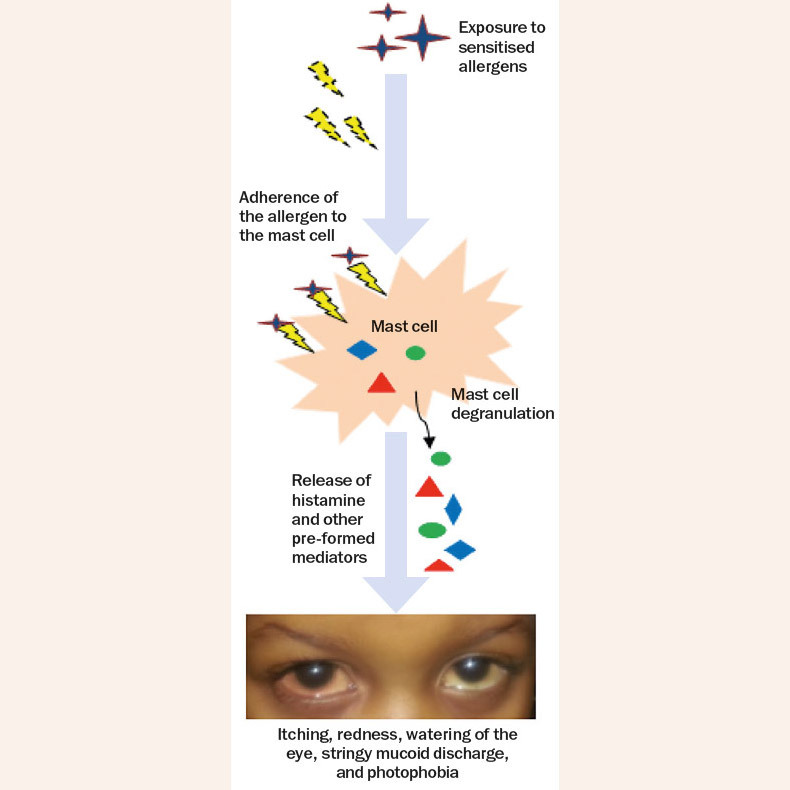 The inflammatory response in vernal and atopic keratoconjunctivitis is due to inflammatory mediators, mainly from mast cells (Figure 5). All patients with ocular allergy should be graded according to the level of severity.6 This is because the grade of severity has an impact on clinical decision making and helps ascertain the patients’ ocular clinical status and risk of vision loss. It also helps to determine the choice of treatment and the timing/frequency of follow-up. Table 1 is based on a simplified clinical grading system which the authors have developed for use in Kenya and which applies to all ocular allergies. It takes into consideration the clinical signs present during the objective assessment but not the patient’s symptoms. The management of ocular allergies in low- and middle-income countries is complicated by the high cost of drugs and the limited options available. Table 2 details the treatment guidelines developed for use in Kenya, based on the severity grading. Pulsed topical steroid regimen (start frequently then taper) +/– topical cyclosporine 0.5–2% until good remission, then stop. 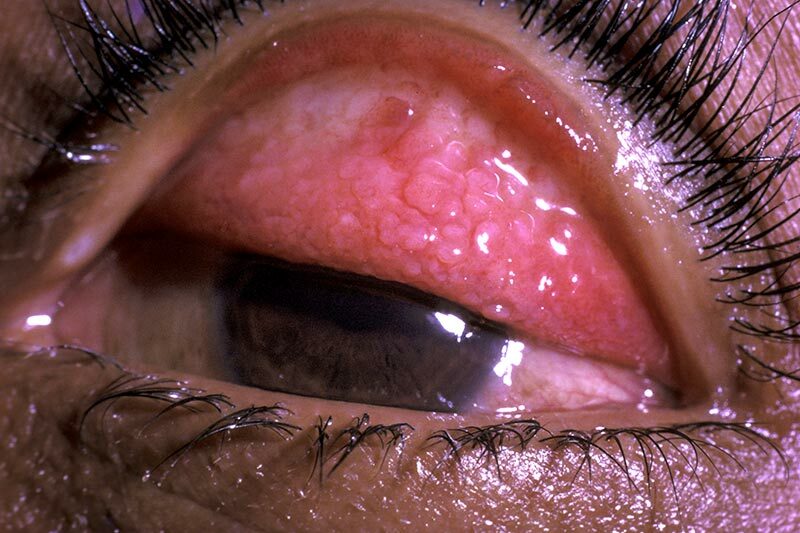 Note: Patients diagnosed with vernal or atopical keratoconjunctivitis should always be treated as ‘severe’ cases, whatever their presenting clinical signs. There are many tools that can be used in the management of ocular allergy. Non-pharmacological treatment, including allergen avoidance and cold compresses, are important for providing short-term relief from symptoms. The patient should also be advised to avoid eye rubbing. Topical lubricants, preferably preservative free, are recommended for use in all grades of severity to dilute allergens and reverse tear film instability secondary to chronic inflammation. Topical antihistamines and mast cell stabilisers are considered as first-line treatment. Mast cell stabilisers require a loading period of up to two weeks in order to achieve maximal efficacy. It should be combined with an antihistamine (short duration of action) or a mild topical steroid such as fluoromethalone to provide faster relief. Mast cell therapy should be continued when the steroids are stopped. Dual-action drugs have both antihistamine and mast cell stabiliser action. They are effective in treating ocular allergy and outperform other groups of drugs. Another benefit is improved compliance because of a reduction in the number of medications to be used. All patients and their carers should be counselled. A well-informed patient and parent/guardian will be in a better position to take part in the management of the condition. Counselling leads to improved compliance with medication and follow-up visits. It also leads to a reduction in self-medication, which in turn reduces possible misuse of steroids. It is important to make patients with sight-threatening disease aware that it can be blinding, so that they can understand the importance of proper follow-up and keeping their appointments. Counselling can also help patients to avoid the complications associated with chronic eye rubbing (keratoconus) and the overuse or misuse of steroids (glaucoma, cataract, etc). Talk to patients about what they can do to support themselves, e.g. avoiding allergens, using cool compresses and preservative-free artificial tears, and wearing spectacles or sunglasses when outside. Basic printed information can be issued to patients during clinic visits. Sight-threatening or non sight-threatening condition? A follow-up visit should include recent history, measurement of visual acuity, and slit lamp biomicroscopy. If corticosteroids are prescribed, measurement of intraocular pressure and pupillary dilation should be performed to evaluate for glaucoma and cataract. If there is inadequate correction of refractive error and a history of frequent changes in spectacle prescriptions, suspect keratoconus. Look out for infections such as viral keratitis and refer all patients with severe disease (i.e. those developing complications) or those not responding to treatment. 1 Takamura E, Uchio E, Ebihara N, Ohno S, Ohashi Y, Okamoto S, et al. Japanese Society of Allergology. Japanese guideline for allergic conjunctival diseases. Allergol Int. 2011;60(2): 191-203. 2 Bonini S, Sacchetti M, Mantelli F, Lambiase A. 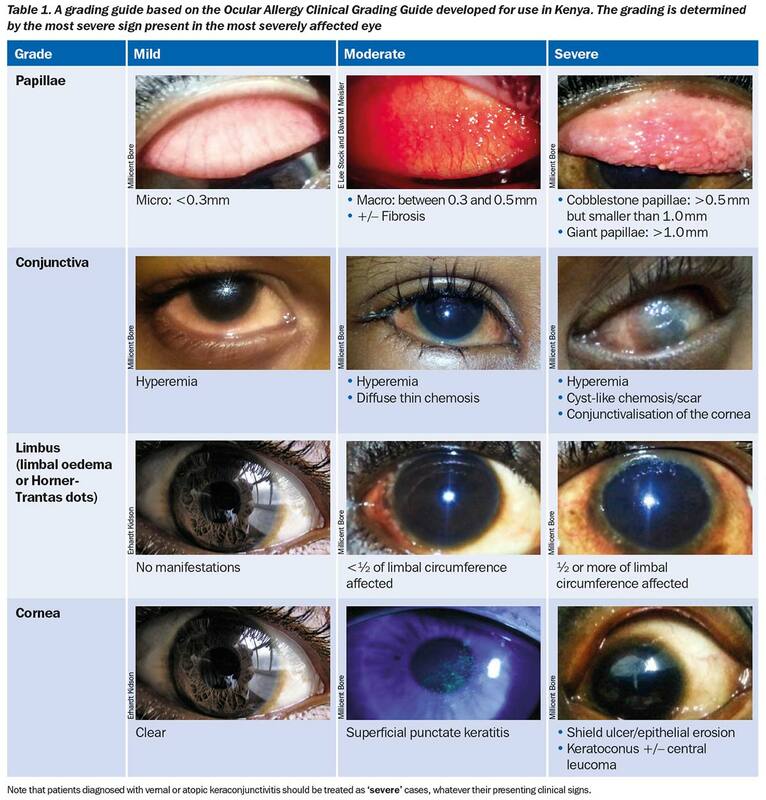 Clinical grading of vernal keratoconjunctivitis. Curr Opin Allergy Clin Immunol. 2007;7(5): 436-41. 3 Calonge M, Herreras JM. Clinical grading of atopic keratoconjunctivitis. Curr Opin Allergy Clin Immunol. 2007;7(5): 442-5. 4 Sacchetti M, Lambiase A, Mantelli F, Deligianni V, Leonardi A, Bonini S. Tailored approach to the treatment of vernal keratoconjunctivitis. Ophthalmol. 2010;117(7): 1294-9. 5 Bore M, Ilako DR, Kariuki MM, Nzinga JM. Clinical evaluation criteria of ocular allergy by ophthalmologists in Kenya and suggested grading systems. JOECSA.2014;18(1): 35-43. 6 Bore M, Ilako DR, Kariuki MM, Nzinga JM. Current management of ocular allergy by ophthalmologists in Kenya. JOECSA.2014;18(2): 59-67. 7 Ozcan AA, Ersoz TR, Dulger E. Management of severe allergic conjunctivitis with topical cyclosporin a 0.05% eyedrops. Cornea. 2007;26(9): 1035-8.